75% of all enslaved Africans coming to America came in through the ports of Charleston, Beaufort and the sea islands of South Carolina. This beautiful and picturesque tourist destination, by its unique history, is the epicenter of the Gullah culture and the foundation of African American history; the result of the mingling of enslaved West Africans with the plantation culture awaiting them in America. The Gullah culture is most popularly portrayed by its influence in language, food, art, music, religion and storytelling, with the underlying message that the lessons of the past must never be forgotten. 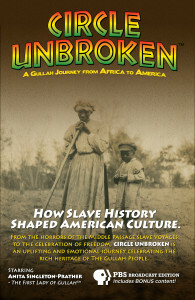 From the horrors of the middle passage slave voyages to the celebration of freedom, “Circle Unbroken” is an uplifting and emotional journey through the rich heritage of the Gullah people. 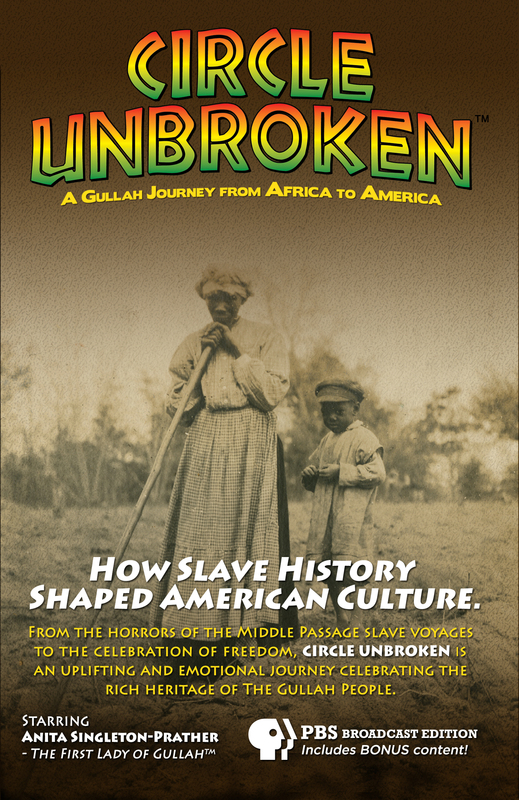 “Circle Unbroken – A Gullah Journey from Africa to America” portrays the story of these resilient people by The Gullah Kinfolk and narrative through the eyes of Anita Singleton-Prather – ‘The First Lady of Gullah™ who uses her exceptional talents to heal, educate and uplift.